7 x 7 x 6 tin that comes with a tight-fitting lid and comfortable carrying handle. The perfect way to store and transport your kava. This beautifully silk screened tin from Kona Kava Farm will hold up to 2lbs of your prized Kava. Food grade interior, with a tight-fitting top and a convenient carrying handle round out this promotional item from Kona Kava Farm. This tin is included for free with the Kava Sampler Pack, but is available separately at a reduced price. We’re amazed at how many of these tins have sold and are excited to be in our 3rd run already. If you want Custom Colors, we’re taking a vote via email and will print our next run with 25% in the requested custom Kava Tin color. 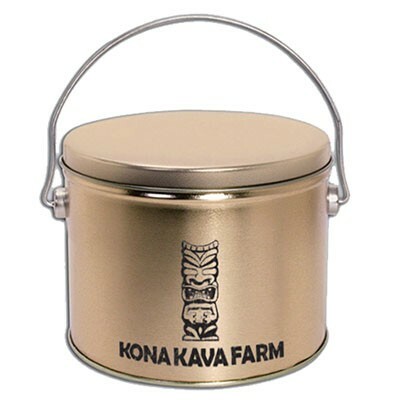 I really like this tin it can hold all your favorite kava products. I got mine from the starter kit for two. I am currently using mine to store some tea. I also really like the little tiki logo on the front, looks cool. A kava lovers must buy. Thanks for the review Pat! Theres no better way to carry your favorite kava products wherever you go.